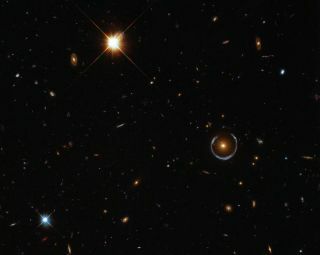 This image illustrates the effect of gravitational lensing. The object in the middle right of the image has a ring of light around it that is created by that object's gravity bending light from a background object. In some cases gravitational lensing will create nearly identical projections of the background object. With the help of a supermassive black hole and Albert Einstein's general theory of relativity, a group of researchers say they have made the first ever detection of planets outside the Milky Way galaxy. Finding planets in our galaxy is hard enough; finding them in more distant galaxies is even more challenging, the researchers said. A central "lens" galaxy and four projections of the background quasar RX J1131-1231. Dai and his co-author, Eduardo Guerras, used NASA's Chandra X-ray Observatory to study the environment around a supermassive black hole in the center of a galaxy located 3.8 billion light-years away from Earth. The galaxy is home to a quasar, an extremely bright source of light thought to be created when a very large black hole accelerates material around it. But the researchers said the results of their study have revealed the presence of planets in a galaxy that lies between Earth and the quasar. Furthermore, the scientists said results suggest that in most galaxies, there are about 2,000 free-floating planets for every star. That means there could be trillions of planets traveling, starless, in the galaxy that lies between the quasar and the Milky Way. When Dai and Guerras turned Chandra toward the quasar RX J1131-1231, they were hoping to use a natural magnifying glass predicted by Einstein's theory of general relativity — a procedure known as gravitational lensing or microlensing — to learn more about the black hole that produced the quasar. As light from a more distant galaxy — in this case, the one containing the quasar — traveled around a smaller galaxy in the foreground, gravity magnified the light from the quasar galaxy, making it easier for astronomers to see features that might otherwise be too distant to observe. "The original purpose of the observations was to study the environment of the supermassive black hole," Dai said. Over the past decade, Chandra has observed the quasar 38 times, and the researchers found planet-like signatures throughout those observations. While the differences could come from "hotspots" in the accretion disk around the black hole, previous research (which Dai participated in) concluded that this was unlikely. By examining how the individual images produced by the lensing galaxy shifted, the researchers were able to estimate how many free-floating worlds might be responsible for the effect. While the number of estimated planets varied depending on how large the individual worlds might be, the researchers estimated that there could be as many as 2,000 free-floating worlds for every star in the foreground galaxy. These worlds most likely formed with the planetary system but were hurled out of it by another gas giant, much like Jupiter cleaned out the young solar system. Each planet would be somewhere between the size of Earth's moon and the size of Jupiter. But most of the booted worlds probably aren't that small. At larger sizes, there could be about one free-floating Jupiter-sized world for every 10 stars, a number consistent with estimates of free-floating planets in the Milky Way, Dai said. The researchers were able to estimate only the number of worlds floating without stars, not those orbiting suns. That's because the gravitational force of orbiting worlds is dramatically overshadowed by their much-larger stars, the researchers said. "The exact number of planets in their analysis depends on specific assumptions, and the uncertainties are large," Przemek Mróz, a researcher at the University of Warsaw in Poland, told Space.com by email. Mróz, who was not part of the new study, said he thinks the study is solid, but that the question of precisely how many planets could be floating in the galaxy is hard to answer. Examining similar variations in other galaxies should help to refine that number, Mróz said. "Observations of other lensed quasars will help to study planet populations in other galaxies," Mróz said. In addition to studying gravitational lensing, Mróz is also a member of the Optical Gravitational Lensing Experiment (OGLE), based at the University of Warsaw, which uses microlensing to hunt down dark matter. Because the experiment uses stars inside the Milky Way as lenses, OGLE has identified several exoplanets in our galaxy. Most Milky Way planets beyond Earth's solar system have been identified using a couple of different methods. The bulk of the very first exoplanets to be discovered were "hot Jupiters," whose masses and close orbits tugged at their stars, causing the stars to wobble slightly. This allowed researchers to identify the planets via what's known as the radial velocity method. Then, instruments like NASA's Kepler space telescope found a wealth of worlds using the transit method, which takes advantage of how planets block the light from their star as they cross between it and Earth. While researchers can re-examine planets found via transit and radial velocity, the rare and random nature of the lineup of two stars means that worlds found by microlensing are one-time deals. Still, scientists have used the method to discover planets located much farther away than those found via the other two methods. In 2006, astronomers using microlensing spotted a planet located 22,000 light-years away from Earth, orbiting a star near the center of the Milky Way. By adding a quasar to the mix, Dai and Guerras have become the first to spot exoplanets outside of the galaxy. But they probably won't be the last, they said. The pair already noted two other lensed quasars that show similar behavior. "Microlensing is somehow unique, because it doesn't require detection of any light from a planet host star or the planet itself. It only uses light from a background object," astronomer Radoslaw Poleski, a microlensing researcher at the Ohio State University, told Space.com. "This makes microlensing the only technique that can detect planets in other galaxies in the foreseeable future," Poleski said. Poleski and Mróz recently suggested that microlensing could be used to spot planets in the Small Magellanic Cloud, a dwarf galaxy located near the Milky Way, using future instruments, such as the Large Synoptic Survey Telescope (LSST), currently under construction in Chile. Instead of relying on a quasar, however, Poleski and Mróz's research suggested that researchers could use light from a background star to identify individual planets around stars in the dwarf galaxy. "We estimate that the LSST will be able to find at least several microlensing events in the [Small Magellanic Cloud] annually, and planetary signals should be observed in some of them," Mroz said.